You might think that you have to travel Route 66 through the western states to see giant roadside oddities. However, I’ve logged thousands of miles traveling all over the state, and I can assure you that there are some crazy things sitting along the state’s roadways. And, while there are dozens of other strange roadside attractions that I have yet to visit, I thought I’d take a minute and share the 10 strangest that I’ve come across so far. As I continue my PA travels, I’m sure I’ll pull over for many, many more great roadside oddities in Pennsylvania. So, look for a future update to this list! Yes, that is a random peg-leg pirate sitting on a major highway outside of Allentown. 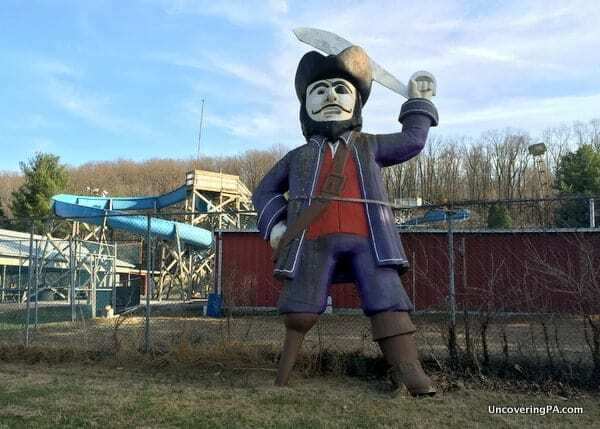 The peg-leg pirate statue just outside of Allentown, Pennsylvania, is a perfect example of a random roadside attraction in Pennsylvania. Located along Route 222, next to the Terry Hill Water Park, the pirate is certainly a strange sight. According to the information I could find, this 20-foot tall pirate is the mascot for the park. However, given that the name of the park has nothing to do with pirates, it is certainly strange to see. If you want to see the pirate for yourself, head to Terry Hill Water Park at 10000 Hamilton Blvd, Breinigsville, PA. The pirate sits along the roadside at the back of the parking area. The Coke Tree in Harrisburg is hidden away, but a great little find. I actually discovered the Coke Tree when I was running to the library near my home in Harrisburg, as it sits about a block down from the East Shore Area Library. As soon as I saw it, I knew I needed to pull over and get a photo of this curious statue. I spent a decent amount of time searching for more information about the history of the Coke Tree or why it’s there, but came up empty handed. However, it’s clearly been carved from a dead tree and whoever did the work had a great eye for detail, as it’s very well done. Can you name your town Mars and not have a flying saucer in it? A miniature flying saucer might seem out of place in western Pennsylvania, but when the town’s name is Mars, it almost seems logical. 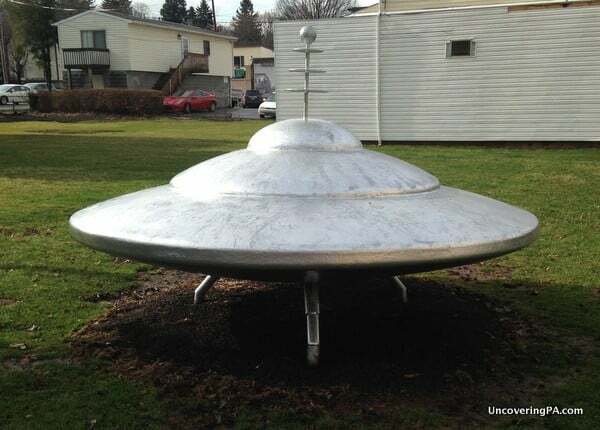 That’s right, in a small park in the center of Mars, Pennsylvania, is a small UFO statue. The flying saucer stands three feet tall and is six feet around. But what it lacks in imposing height or intergalactic history, it certainly makes up for in humorous curiosity. The Flying Saucer in Mars, Pennsylvania, is located at 100 Pittsburgh St., Mars, PA 16046. Towering above the small borough of Tionesta, the Sherman Memorial Lighthouse serves no significant purpose. Located in the middle of Forest County, is one of Pennsylvania’s most unusual roadside buildings: the Sherman Memorial Lighthouse. 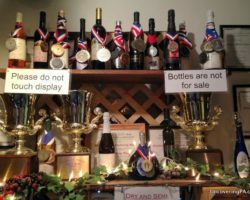 Its location along the Allegheny River might give you the impression that it serves a purpose, but it doesn’t. In fact, the lighthouse is located roughly 60 miles from the closest navigable body of water, Lake Erie. 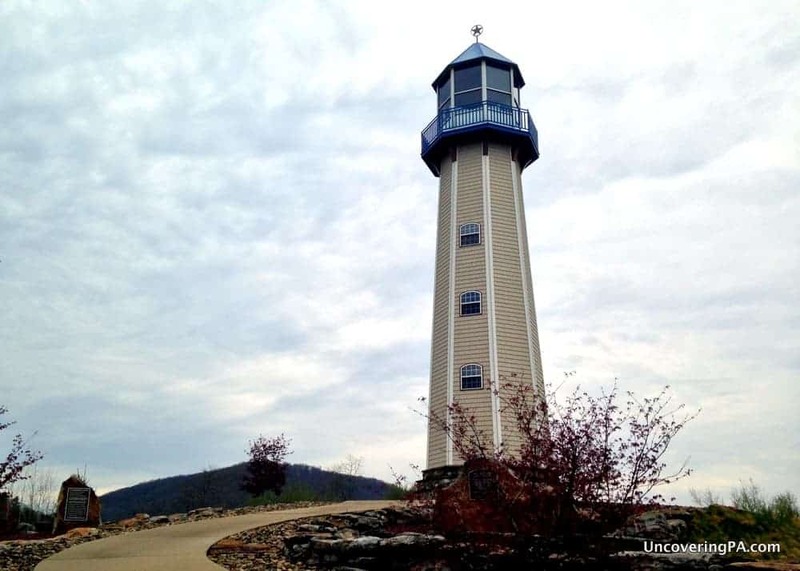 The 75-foot tall lighthouse was completed in 2004 and was built by local Jack Sherman as a memorial to his family and to hold his large collection of miniature lighthouses. The lighthouse is open to visitors several times a year, and, I’ve been told that the view from the top is fantastic. 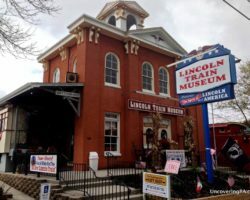 For more information about visiting the Sherman Memorial Lighthouse in Tionesta, Pennsylvania, check out my full article. There are 32 Punxsutawney Phil statues in Punxsutawney, Pennsylvania. Punxsutawney, Pennsylvania, is known worldwide for its fantastic Groundhog Day celebration. To celebrate this heritage, the borough commissioned 32 larger-than-life Punxsutawney Phils to be painted by local artists and placed around town. The statues range from comical to serious, but each shows off an aspect of Punxsutawney’s heritage. While in town, don’t miss Phil’s home, which is located next to the library. 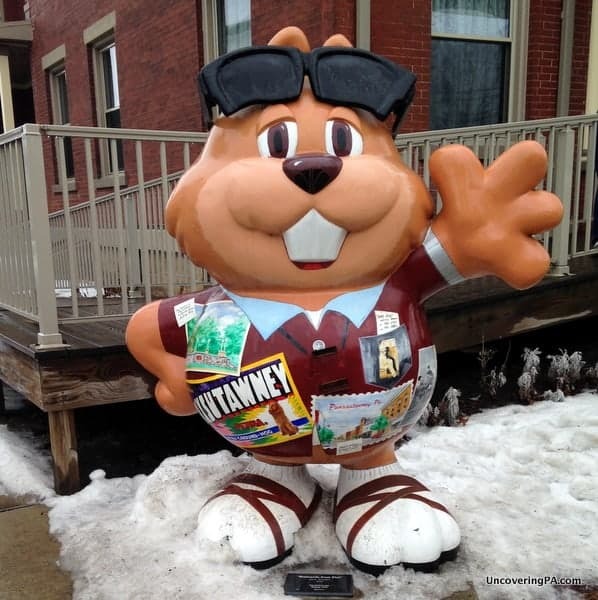 The Punxsutawney Phil statues are located all around the borough. Visit their website for information on the location of all 32. The Statue of Liberty in the Susquehanna River near Harrisburg. 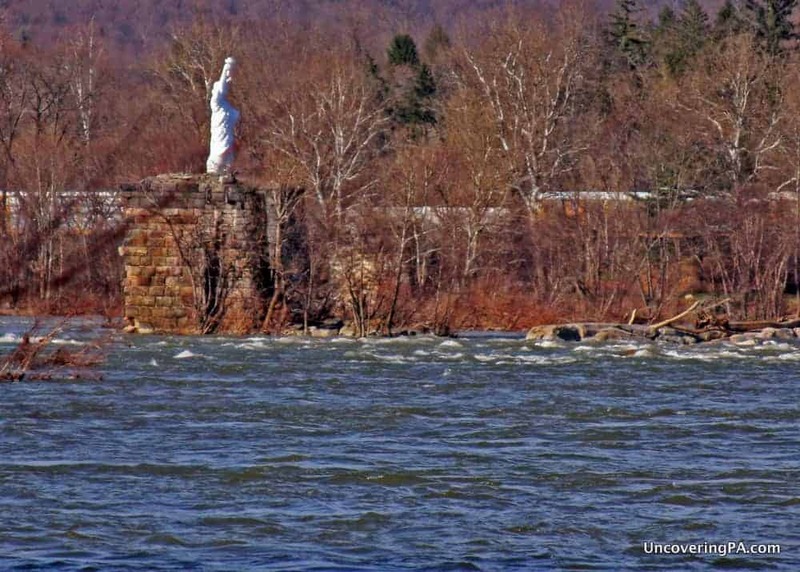 This replica of the Statue of Liberty sits in the middle of the Susquehanna River, just north of Harrisburg, along route 322/22 (It is also visible from Route 11/15 on the western shore of the river). The fact that it doesn’t cause daily accidents along this busy highway is quite remarkable, as it seems more drivers look at it than the road while passing by. The statue is actually the second one at that location. The first was made of plywood and venetian blinds and was put in place in 1986 by a secretive group of local citizens. After it was washed away by a flood six years later, the second, larger, statue was put in place in 1997. 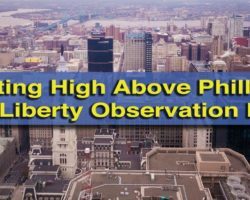 To find out more information about the Statue of Liberty near Harrisburg, read my full article with history and directions on how to get a closer look. 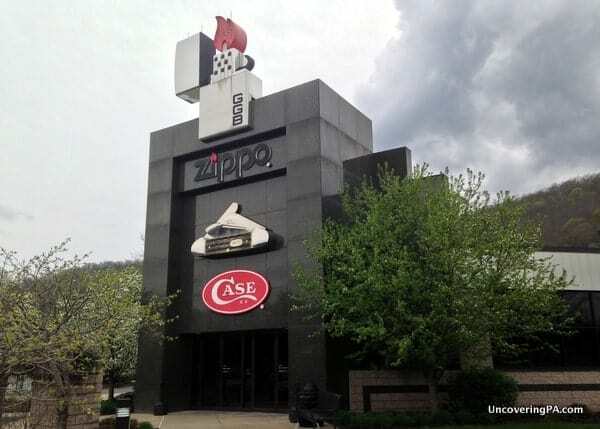 The awesome entrance to the Zippo/Case Museum features a giant Zippo lighter. Until I visited the area, I had no idea that Zippo Lighters are made in Bradford, Pennsylvania. And, even thought I’ve never owned one, I took the time to visit their museum on the outskirts of town. However, what’s atop their building is nearly as interesting as what’s inside. You see, atop the entrance to the Zippo museum and gift shop is a giant Zippo lighter. While I couldn’t find any information about the history of the giant Zippo lighter, it’s worth seeing, as is the free museum inside. The lighter is located at 1932 Zippo Drive, Bradford, PA 16701. The Fireman’s Drinking Fountain is one of the most unique statues I’ve seen anywhere. Located in the town of Slatington, a few miles north of Allentown, PA, is one of the coolest statues I’ve ever come across. Had the Fireman’s Drinking Fountain been a normal statue, it wouldn’t draw much attention; however, the bright paint color makes this statue very unique. Of course, as the name implies, it also isn’t just a statue. When it was built in 1909, it was designed to recognize the volunteer firefighters of the town. The 12-foot tall statue was placed atop a drinking fountain that provided water for the community. Somewhat surprisingly, the fountain still works. The Fireman’s Drinking Fountain can be found at 560 Main Street, Slatington, PA 18080. Decker Chapel in Saint Marys may be the smallest church in the USA. 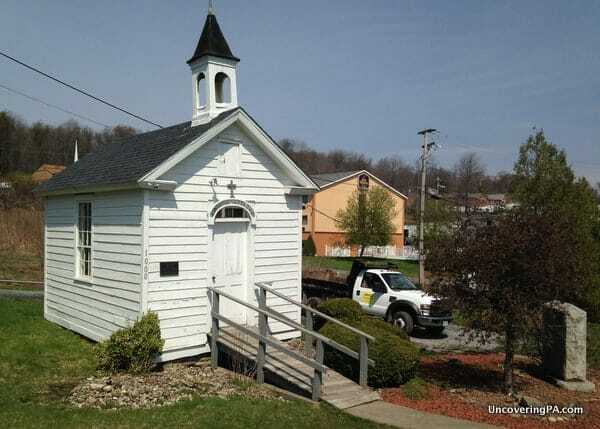 Located on the outskirts of Saint Marys, Pennsylvania, Decker Chapel bills itself as the smallest church in America. Whether this is true or not, I have no idea. However, at 12 feet by 18 feet, the chapel is quite small. Inside, there is a small altar, but little else, which isn’t exactly surprising given the size. Decker Chapel was built in 1856 by Michael Decker and is listed on the National Register of Historic Places. It is located on Million Dollar Highway at the following coordinates: 41.400856, -78.560403. Stinson the Dinosaur has a much more noble purpose than many roadside oddities in Pennsylvania. 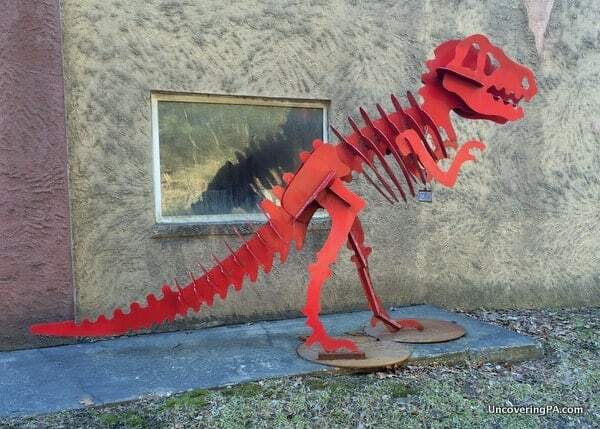 Located outside an old warehouse on a backroad in Carbon County is Stinson the Dinosaur. At 9 feet tall and 15 feet long, Stinson isn’t the biggest roadside oddity on the list. However, what he lacks in size, he makes up for in purpose. You see, Stinson was created to raise awareness and money for strokes (as well as small business awareness for some reason). Stinson’s bright red color stands out from the grey building behind it, making it a must-see roadside oddity when in Carbon County. Stinson even has his own website, where you can find out more about him and buy your own mini Stinson the Dinosaur. 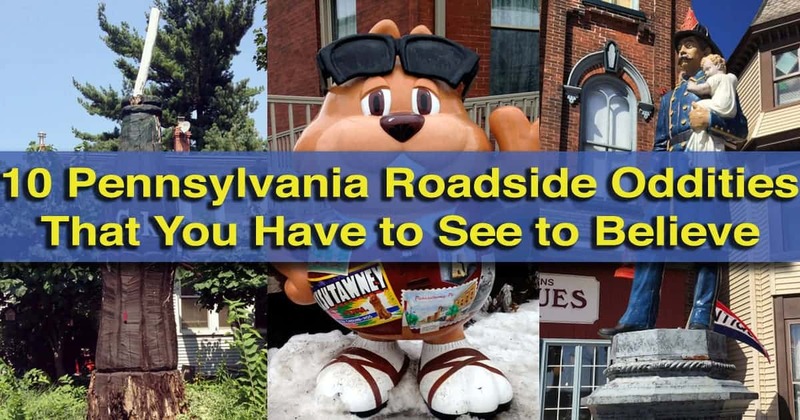 Do you have a favorite roadside oddity in Pennsylvania? Let me know in the comments below! Willing to get out of the car? 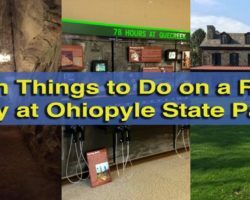 Experience other PA oddities such as Fonthill Castle, Gravity Hill, Columcille Megalith Park, and Sherman Lighthouse. Along the same lines as the Punx Phils, Boyertown has bears all over their town as well. How about the coffeepot in Bedford and Mr. Pickle in Dillsburg….Noah’s Ark at Kennywood Park. I forgot about Kennywood. Thank You. The Haines Shoe House in York PA should make any list like this! That’s definitely looks like an awesome place, Max. This is simply a list of the 10 best I’ve seen so far. Unfortunately, I haven’t had a chance to visit and photograph the Shoe House yet. Otherwise, I’m sure it would have made the list. The shoe house is worth a trip.. fantastic ice cream too!! This is a nice article. Just slightly inaccurate on the fireman statue, however—It’s where I grew up. The fountain part wasn’t added until 1979, when it was knocked down by a car. They added the water fountains during the rebuilding. Before that, it was, in fact, just a statue. There’s an identical one in the cemetery just up the hill from it. 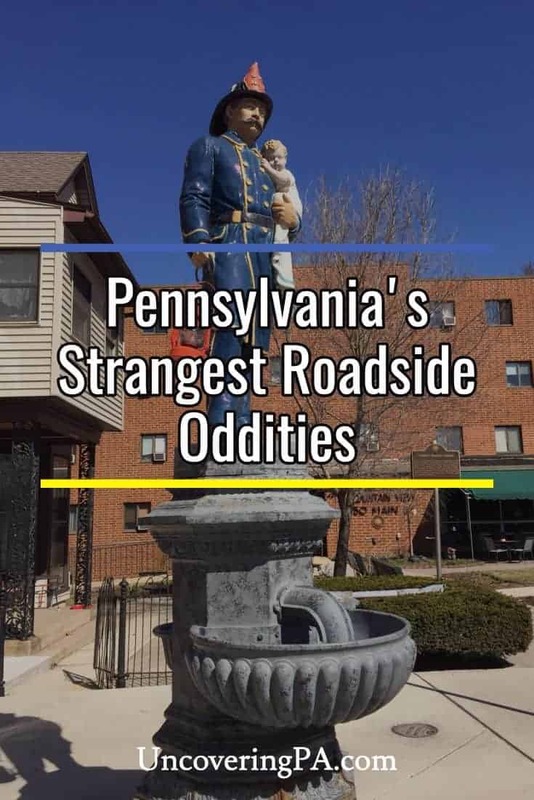 It isn’t an oddity but there is a replica statue, the only of it’s kind, in Ashland, Pennsylvania. What do you mean by a replica statue? check out the cool art made out of signs! How about the cowboy holding the giant hamburger outside of the Cadet restaurant on 422, just barely East of Kittanning. Sounds interesting, Kimberly. I’ll have to check it out someday. Just drove by there yesterday… it’s pretty neat!! The cow is located close to Reedsville along the road on the left if you are coming from Rt. 322. I pass it on Wednesdays going to Bellville to set up for market. There is a giant cow statue in Clarion County near Sligo just off Rte. 68 at Over Road. That does sound interesting. I’ll have to check it out the next time I’m in the area. I get to pass the Coke statute all the time. There was a story in the Patriot News years ago about it. If I remember correctly, the house owner loved Coke (of course). She had an entire room of Coke memorabilia and collectables. When her tree died, she had it carved into a huge bottle of her favorite beverage! It is now rotting badly at the bottom. How long will it still be there? Hopefully it’s not lost. It’s a very cool place to check out. I’m glad I stumbled across it. That’s pretty awesome, Kelly! Reminds me of The Muppet Movie. Interesting. Thanks for sharing, Marty. I’m hoping to be up that way sometime soon, so I’ll definitely keep this in mind. The York Barbell weightlifter at the Weight Lifting Hall of Fame along I-83 near York is cool, too. Also the Reading Pagoda. I know, there is so many, the list could be top 100. I’ve driven past it many times, Karen, and it is very cool. I just haven’t ever had a chance to grab a photo. There are also some cool things along I-81 between Harrisburg and the Maryland border. I also wanted to say the “Big Cow” from Kersey, PA that has now been moved! I am from Saint Marys, PS and love Decker’s Chapel! There’s a place at the corner of State St. and Rising Sun Rd. in MIllersburg, PA that has a tree carved for (what I’m assuming is) their favorite baseball team -the Cardinals. It’s a large baseball bat with a cardinal on top. YOu can see it on Google Maps satellite image. Interesting. I’ll have to check that out the next time I’m in the area. Go to the lookout above Ohiopyle. Is there something strange to see there? I’ve been, and it’s a great view, but I don’t remember any oddities. 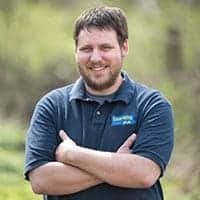 I too am from St. Marys, Pa and have had the pleasure of growing up around Deckers Chapel and the Kersey Cow, along with the Ground Hog in Punxsutawney Pa. I now live in Harrisburg Pa and have seen the Coke tree and the Statue of Liberty. Have you checked out the painted cows in different places around Harrisburg and City Island? They sure are different and I think you may like them Jim. I have see the cows in Harrisburg. Pretty cool! I live mere feet outside of Harrisburg, so I visit pretty often. 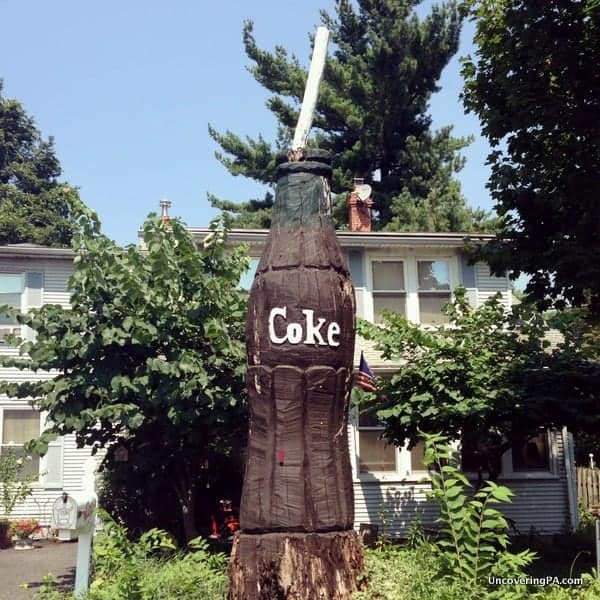 I remember when the coke tree was being carved. I was the mailman there. I know why they did it. But never thought they’d do that. Out of curiosity, why did they do it, J.D.? 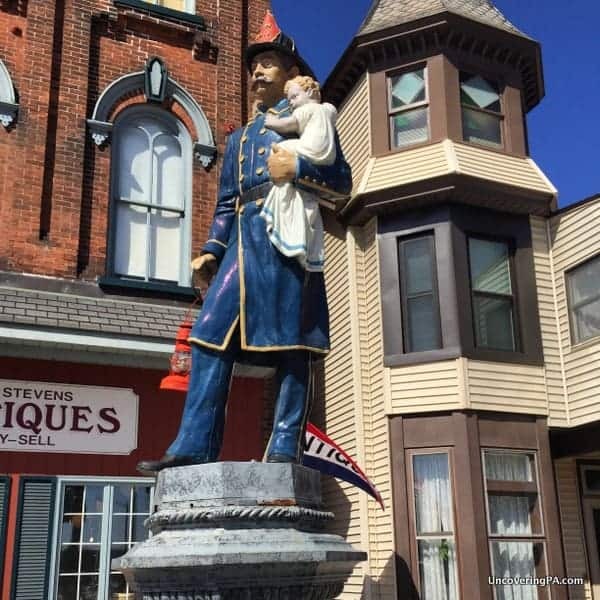 Jim the man that wrote about the firemans statue in Slatington was not correct . I happen to be part of Hose co #1 that erected the statue in 1909 and the fountains were in working order for man and beast. but some were around ww2 the fountain parts were taken off and melted down for the war .When the statue was hit by a hit and run driver in 1980 myself and 6 others on the statue restoration committee began the task of putting our statue back to its original look in 1909. We used old photos and had a firm remold the fountain parts from aluminum , Many people and organizations were involved in the restoration. Thanks and have a good day. Thanks for the great information, Jon. Good to know more of the story. There is a brand new carving in front of a private residence in Cochranton on PA 173 heading into town from US 322. It is out of a large tree that was taken down and is carved into a long-bearded wizard (Gandalf? Dumbledore?) and at the top of his staff is a cardinal, the HS mascot. Also, Pittsburgh has many dinosaur statues around the city, including Ketchupsaurus in Heinz Plaza. Decker’s Chapel in St. Mary’s is currently closed to the public. You can drive past and see it. But the foundation has taken a beating from the last couple rough winters and the building is tipping. It looks like they are in the process of repairs. It is on route 28 between New Bethlehem and Brookville. The only one of these I’ve seen is the Statue of Liberty in the Susquehanna — thanks to having a kid who went to “We are….Penn State”. We Philly types don’t get to the rest of the state enough. We’re more oriented to the I 95 northeast corridor than the PA Turnpike. Very true, but there are a lot of things to do in PA, but close to and rather far away from Philadelphia. The maniquin in the phone booth is in Summerville, PA on 28 south headed toward Pittsburgh… I always look for it every time I travel through there. Interesting. I’ll have to look for that the next time I’m in the area. I have seen that Volkswagen and think it is pretty neat. wish I would of took a picture of it. the “fork” at the fork in the road in Centerport, Berks County. It was put there several years ago now and is a huge metal fork. How about the statue of George Washington wearing a British military uniform in Waterford, PA. I don’t know that I would personally call that an oddity, but it is very cool. Glad I had a chance to check it out and photograph it a few months ago. Not so much an oddity when you consider G.W.’s early military service with the British Army…I have not been to Waterford and know not of this statue to which you refer. But, G.W. did serve as a militia officer with the British on its excursion with Braddock in W. Pa. in the early stages of the French and Indian War. Washington’s first visit to western PA was leading his own expedition to present-day Waterford. In fact, he didn’t hook up with Braddock until his third trip out west. While the statue might make sense, it is the only one that features Washington in a British uniform, so it certainly makes it, at the very least, unique. That Fireman statue is not unique. Its famous and replicas appear all over the place. There’s one in front of the fire museum in York, Pa. There may be replicas, but if anything, that makes this one all the cooler. Really, that’s a shame. I live a couple miles away, so I’ll have to drive by and check it out. Funny you should mention that. I literally just stopped by it today. I’m sure it’ll make the next list like this that I make. How about Mr Pickle who welcomes you to Dillsburg PA on Harrisburg Street? The statue of a Green Dragon for its namesake farmers market along Rt 322 in Ephrata, Pa. There is the random dragon on 11/15 near liverpool pa. Drive by it everyday, always wondered why it was there. Out front of lumberjack restaurant. The lion water fountain at the intersection of Routes 19 & 68 in Zelienople. Somewhere on the Kylertown Drifting Highway, there is a big Yogi Bear statue In front of somebody’s home. Dont know why it’s there but it is. Maybe someone can help me out here, I remember traveling between Oil City and Warren (probably on 62 N), and there was a building that had a gorilla on the roof. It has been many years since I’ve driven that, and I was a child then. I think the building was one story and yellow. I am fairly certain that the gorilla had nothing to do with the product or the name. I could be wrong about that. Don’t know if it’s still there or long gone. Thanks in advance for the help! Schaefer’s auto art in Erie, Pa on Hershey road. Giant spider made out of a Volkswagen bug, bubble bee made out of a cement mixer, two headed car and more! Check out the GAP Clock tower in GAP PA. It’s about a mile on PA route 41 from US 30 East. It used to stand atop the building that now houses the GAP cheese shop, which is right next door. The giant Amishman outside Hershyfarm smorgasbord and motel in Ronks PA. It used to stand outside Zins Diner, which is now the Park Ave Diner in Denver PA.